People often ask us for suggestions on how to improve their running. 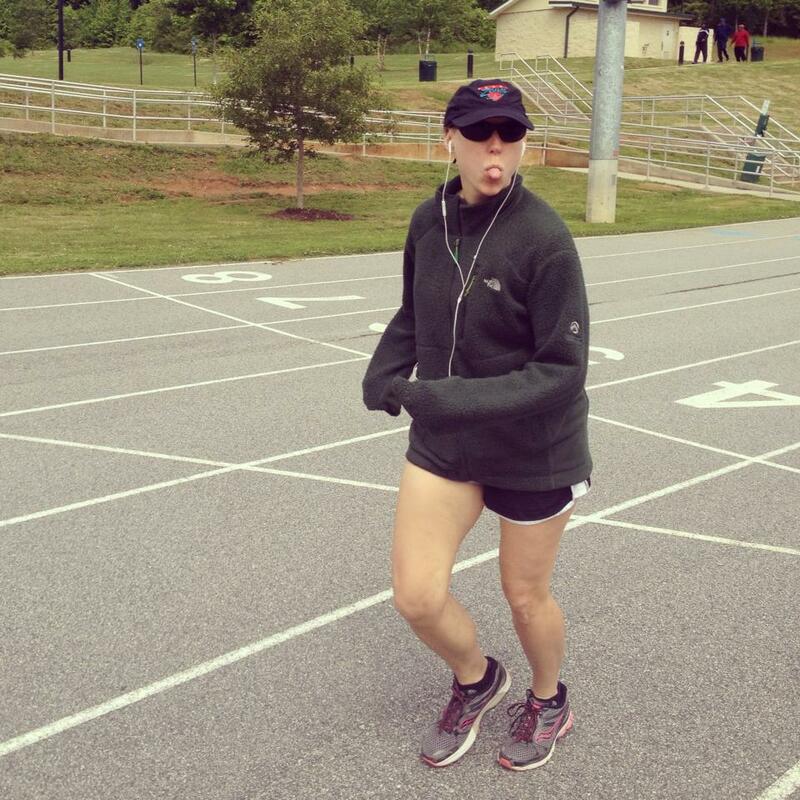 Has your running gotten stale with little or no improvement? Do you run the same distance at the same intensity all of the time? If so, you’re not alone. Variety is not only the spice of life, but it’s also a key concept in training. You need variety in your running in order to improve. In this article we’re going to lay out three types of workouts to improve your running by adding some variety. Hiring a coach or personal trainer is a great idea (disclosure: Mary Catherine is a personal trainer). They will give you very specific advice that is custom-tailored to your needs. 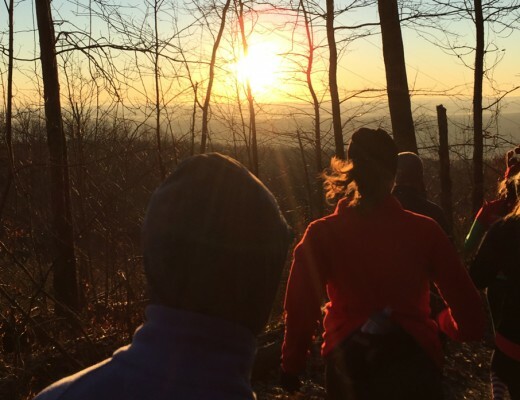 Joining a running group or training program is also a great idea. If you want to self-coach or just be a more informed client, then look no further. Here’s a quick, simplified overview of three key workouts common to most all training programs that will improve your running. Note: we assume the reader is already a runner and can run 3-4 miles continuously. 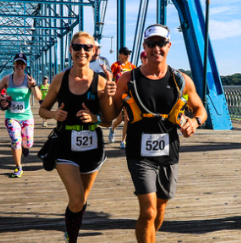 If you’re a total beginner to running, then work on building your base miles so that you can comfortably run 3-4 miles non-stop before attempting the workouts in this article. 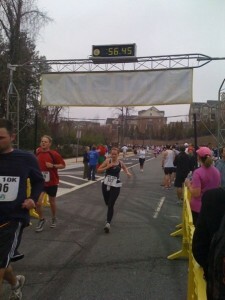 Mary Catherine crossing the line at the Chattahoochee 10K with a new PR – the result of a great training program. 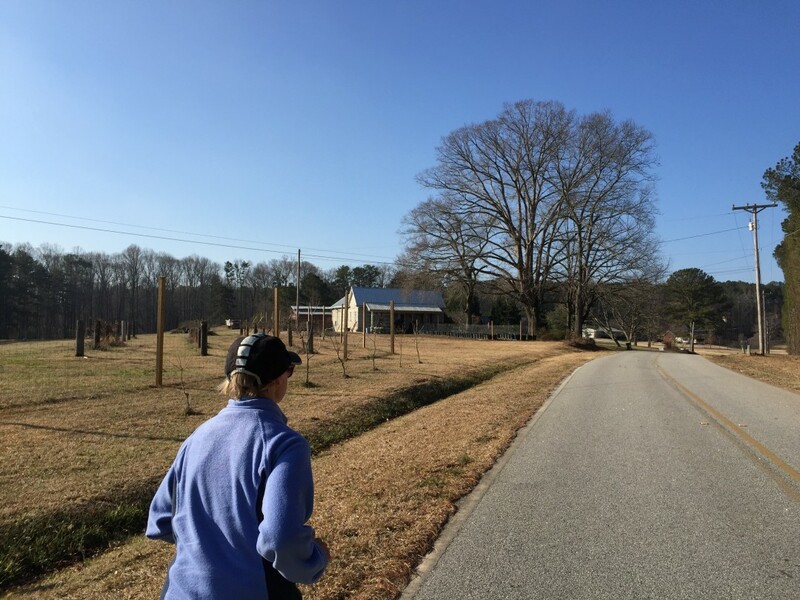 A wise running mentor once told me, “You have to run fast to run fast and you have to run long to run long.” In case you’re wondering…that mentor wasn’t Yogi Berra, but the self-evident wisdom has stuck with me ever since. There’s a wealth of books and online training articles about how to train for running. It’s fun to read all those articles, but sometimes they can be overwhelming. 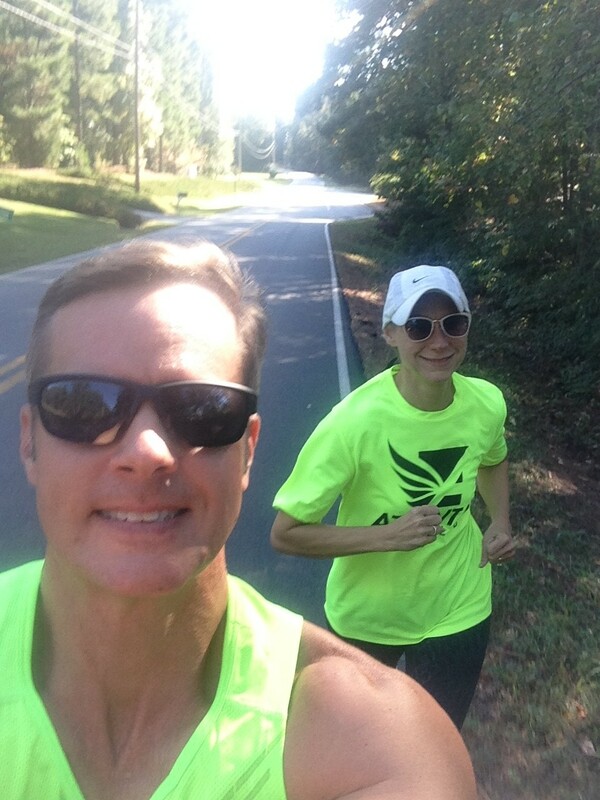 Joe and Mary Catherine starting out on another run together. One of the better books to come out about the three key workouts is “Run Less, Run Faster” by Bill Pierce and Scott Murr. 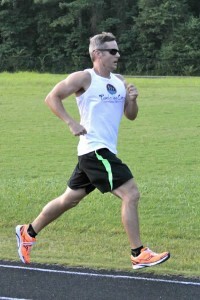 The book is the outgrowth of the very successful Furman Institute of Running and Scientific Training (FIRST) program. It’s a great book and I highly recommend it. Be forewarned, they take the concept of three to the extreme – you only run three times a week and cross-train two additional days. I like to run more than three times a week, but the training concepts in the book are sound. Drawing upon my mentors and various books I’ve read, here’s my version of the three key workouts you should do each week in order to improve your running. By design I’m going to shy away from technical terms and scientific quantification and simply appeal to your own common sense as a runner. Note to advanced runners – I know I’m oversimplifying things, but don’t you think we sometimes make running too complicated? Let’s look at the three key workouts starting with speed. Joe running 800m on the track. Photo by Normer Adams. Interval runs build raw speed. A typical interval run is a short warm-up, sets of short, faster runs with small breaks in between, then a cool-down. An interval run is performed at a very fast pace (typically based on heart-rate, 5K pace, or perceived exertion). Fartlek – a Swedish word meaning “speed play”, this is an unstructured interval where you might sprint from one mailbox to another during a run. You basically run hard when you feel like it. This is a great introduction to intervals. Ladders and Pyramids – various methods of making the work intervals longer and shorter. As I’m writing this article, the winter months are approaching. Although I’m personally not a fan of treadmill running, the treadmill is an ideal place to do an interval workout, too. 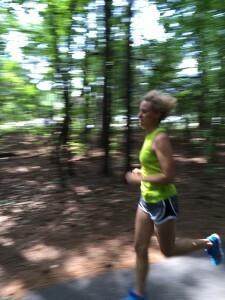 Mary Catherine holding a fast pace during a tempo run. The tempo or threshold run builds stamina – the ability to hold a fast pace. Whereas the interval run builds raw speed, the tempo run builds sustained speed such as that required when you race. It usually involves a warm-up, a fast few miles (based on heart-rate or 10K/Half-marathon pace), then a cool-down. Unlike the intervals, the working portion of a tempo run is continuous so naturally your pace will be slower than that of an interval workout. Most beginning runners struggle with tempo runs (and I do too) – they’re hard! It’s important to note that the working section of the workout is not all out. It should be a sustained hard effort that tests you, but doesn’t wear you out totally. You can vary the length of the working portion depending upon fitness ability and what you’re training for. In general, the longer the working set the slower the pace. 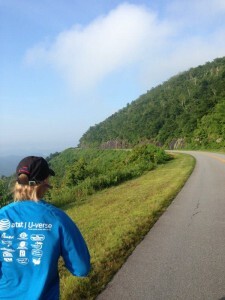 Mary Catherine running a long hill on the Blue Ridge Parkway near Fryingpan Mountain. 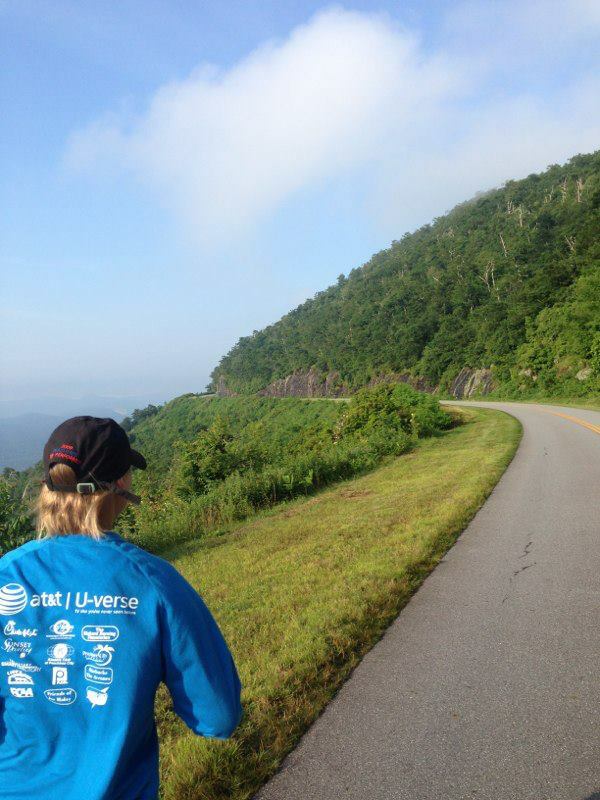 The long run builds endurance and the ability to run far distances. Unlike intervals or tempo runs, the purpose of this run is to NOT run fast! 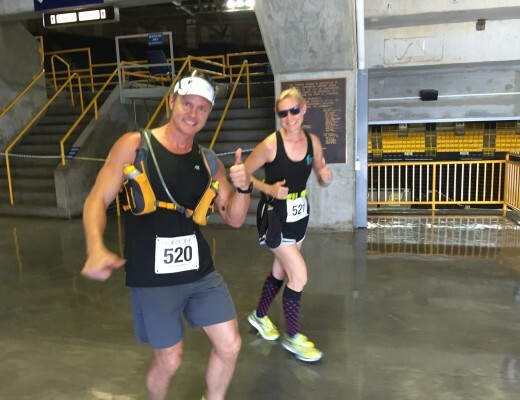 In fact, a true endurance run should be done at a conversational pace and that’s why many people enjoy doing their long runs with friends. A typical endurance run doesn’t need a warm-up or a cool-down, the run itself is plenty of warm-up. If you are training for a half-marathon, full marathon, or longer – the long run is the most important workout and usually involves a gradual build-up of mileage every 2-3 weeks. 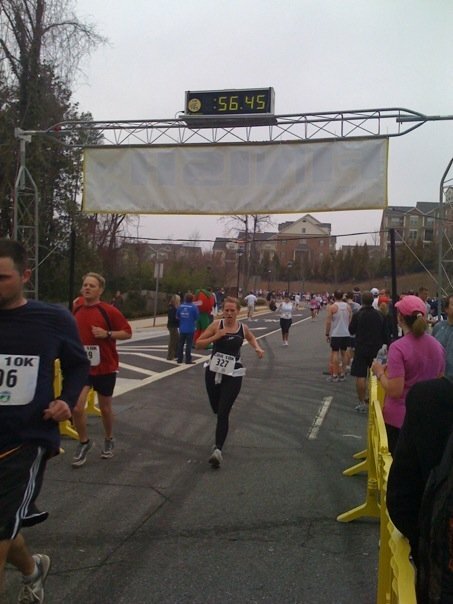 Even if you’re a 5K runner, your running will improve with some long runs. Some runners prefer to measure the amount of running by time instead of distance, so you could reframe the run as a “2 hour run”. The pace should be 1-2 minutes per mile slower than marathon pace. The goal is to teach your body how to endure. 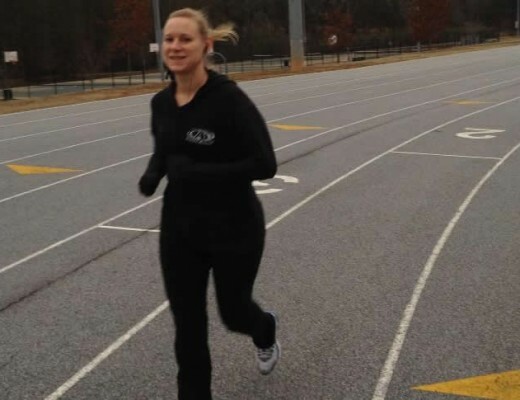 Mary Catherine having a little recovery jog at the track. Daily runs – a moderate distance run at a runner’s natural pace. The typical runner has too many daily runs and not enough variety and that’s why their performance stagnates. Recovery runs – a short, easy run done at a very comfortable pace. So there you have it – the three key workouts for improving your running: intervals, stamina, and endurance. Most all modern training programs for running can be simplified into these three workouts. Don’t get too caught up in the jargon of lactate threshold, race pace, etc. Just remember to run fast, run hard, and run long to improve your running.